My love of beauty oils is no secret, and while I certainly have been known to indulge in many from the ultra luxe category, there are numerous more budget friendly oils that I truly love. Chief among them is the Mario Badescu Rose Hips Nourishing Oil. This is an ultra lightweight fast absorbing oil that is nourishing, deeply hydrating and incredibly soothing. Whenever my skin is at all irritated or sensitive, this is one of my most reached for oils. It immediately calms down irritated skin, gives me all of the moisture that I need, and leaves my skin the luminous glow that I have come to expect from the face oils that I use. Furthermore, I love using this oil on my hands and cuticles under a heavier hand cream, or I add a few drops into a hand cream for added nourishment and moisture. After cleansing and toning, massage 2-3 drops on face and neck avoiding eye area. Follow with moisturizer or night cream.Apply a few drops before your favorite moisture mask for increased moisturization and nourishment. I apply a few drops to my warm damp freshly cleansed skin and gently massage it in until it is absorbed. 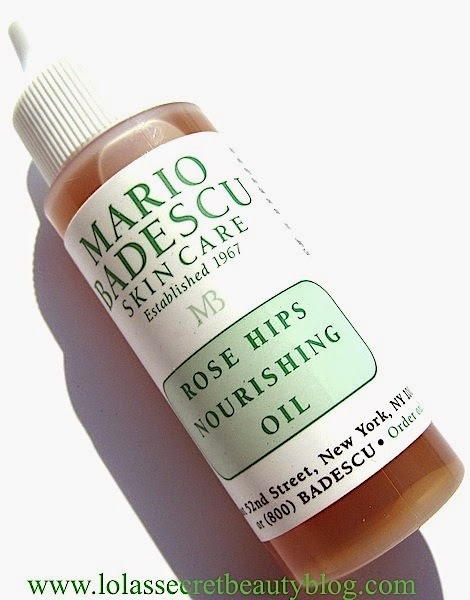 The consistency is a bit lighter than many of the oils that I use since Mario Badescu's Rose Hips Nourishing Oil contains several non oil ingredients that lightens the texture considerably. This works beautifully on my combination skin, but those among you with particularly dry skin who rely on very thick rich oils will likely require the use of a richer cream on top of this oil at night. I find that it is hydrating enough to wear alone at night, and people with oily to normal skin may be able to do this as well. I use it day and night on my face, neck and décolleté, and also add a few drops to my foundation or tinted moisturizer for added hydration and luminosity. It has the pleasant scent of Rose Hips Extract, but it dissipates soon after application. Mario Badescu is a Cruelty Free company. Overall assessment: This is a very nice oil at a reasonable price point. $20.00 for 1 oz. Available from Mario Badescu, Nordstrom & Ulta (Affiliate Links). always nice to find one that does not break the bank, eh, helen? now you can afford that elemis exotic shower cream! :D have a lovely weekend yourself! i am really liking the algenist oil. like the mario badescu above, it is nowhere near moisturizing enough on its own for me and i need a heavier moisturizer, but there are noticeable benefits. I'm so happy that you are liking the Algenist Oil-- I think that it is a truly lovely product! I suspected that you would require an additional moisturizer, but I'm just thrilled that it's working for you, and that not of the ingredients that caused you to raise an eyebrow have caused you any trouble. We didn't do much of anything last night either. However, we watched the fireworks from our kitchen window You can see the big show at the Hollywood Bowl from our house-- so that's always enjoyable, but Delilah and Lucy were barking and running through the house like demented canines-- so we stayed inside to try and keep them calm. I can only just imagine how dry it is where you are! The drought has been unkind to our state, but you seem to be more hard hit than we are because of the fire dangers associated with a dried out countryside! Yes, that shower cream sounds utterly delectable! The body oil certainly is special! Enjoy the rest of the weekend with your family! watching the hollywood bowl from home sounds perfect, helen! That's what we tend to do every year, but we usually climb up on our roof and then can see a couple of different fireworks. Definitely not as spectacular as what you did as a kid though! That's so cool that your parents made it so special! I went to Disneyland on the 4th of July as an adult, and it was pretty amazing! Mario Badescu makes some great little gems, love the Rose Water Facial Spray. Can't be bear for $7!